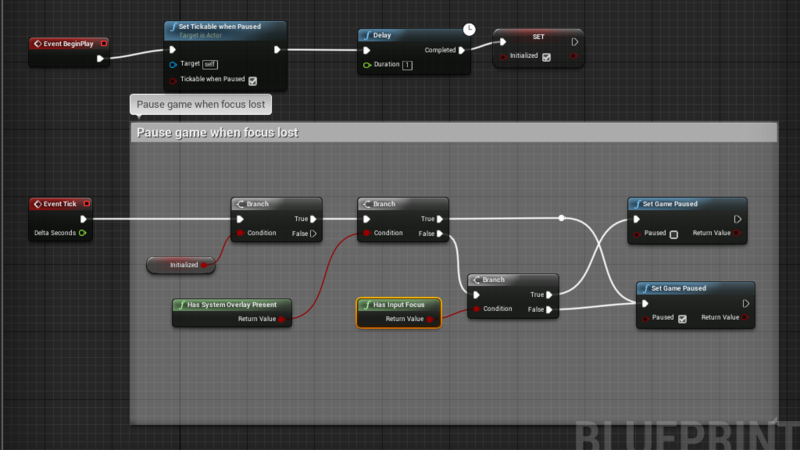 I'm having trouble pausing the game using either 'Has Input Focus' or 'Get VR Focus State' blueprint node (and passing certification). I'm also using 'Has System Overlay Present' to check and pause the game if the Oculus overlay is displayed (which works fine). I've checked this on Unreal binary distribution 4.18 and 4.19. Current behaviour is that after about 10 seconds from removing the headset the game pauses but it does not pass certification so I assume there has to be abetter way or something is wrong? I was also looking at 'UnrealSample' from Oculus SDK but couldn't find anything related to pausing the game in that situation. 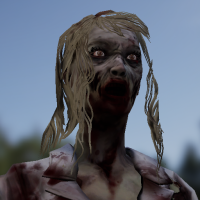 Behaviour is implemented inside Game Mode blueprint, the actors that supposed to pause have the 'Tick Even if Paused' disabled. 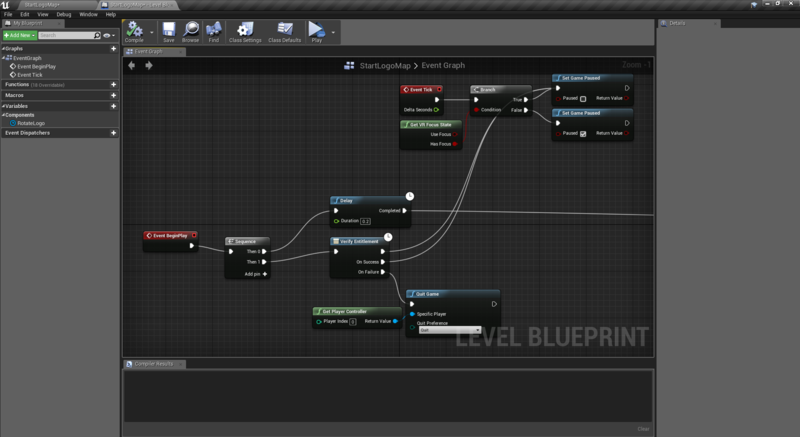 If anyone has some ideas or samples (blueprint or c++) that could show the working way to do this I will be very thankful. It does work in game mode (game mode is present on every level). What's more, the solution I've posted works correctly (was not mentioned in review result). 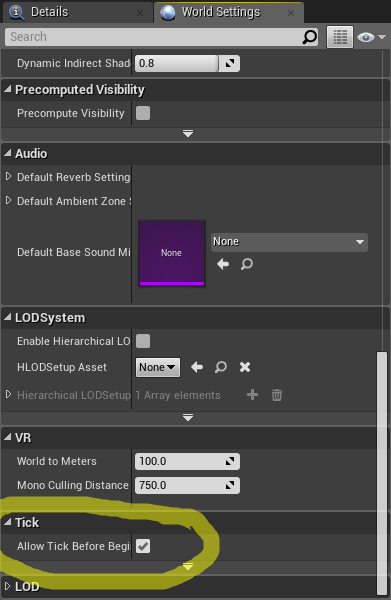 As suggested by the reviewer I've enabled dash mode ( https://developer.oculus.com/documentation/unreal/latest/concepts/unreal-dash/ ), which should be just different pause display mode. So I'm guessing either the review process is not consistent or the documentation is wrong. This is how i got it to work for me. When I set game paused, it stops the tick so it doesnt check again. Any solutions to this? There's a blueprint node called "SetTickableWhenPaused" that you set to "Target: Self", which will allow the blueprint you're in to keep firing the Event Tick even when you've set the game to paused.